Is your dog shy around strangers? Do they get anxious in new situations? If so chances are your dog could benefit from some confidence building exercises — and one of the easiest ways to do that is by using games. Experiencing new things in a positive way can help boost your dog’s confidence, and using games is a simple way to work on it. From free shaping games to interactive play, here’s 5 confidence building games for dogs. Tip: If you’re looking for more fun activities to do with your dog be sure to check out 33 ways to keep your dog busy indoors, 26 boredom busters for dogs, and 10 fun games to play with your dog. Before we get into the games themselves let’s take a quick minute to talk about why games are so beneficial to shy and fearful dogs to begin with. Playing games with your dog gives them something fun and meaningful to focus on. And games are good for fearful dogs because they give them a chance to learn something new without having to worry about consequences. In other words it gives them something positive to focus on in the moment, rather than worrying about the environment around them. Keeping situations fun and engaging for your dog by using games can help keep their mind off of the things that otherwise might cause them anxiety. Keep in mind some dogs are more fearful than others, and trying to get an overly anxious dog to play in certain situations isn’t going to happen right away — you need to build up to it. For example, if your dog is fearful around strangers and you decide to teach your dog to “touch” hands start by using your friends and neighbors first in locations they’re somewhat familiar with before moving onto strangers at the park. Confidence building takes time, but the good thing about using games is that they’re versatile. They can be used in different situations, and they’re easy to get started. And since they’re a lot of fun so they’ll also help strengthen the bond between you and your dog. Shaping is the act of building up a particular behavior by using a series of small steps to achieve it. The basic principle of shaping is teaching your dog a new behavior without using any corrections. It can help boost your dog’s confidence by encouraging your dog to try something new without having to worry about the consequences. If you haven’t heard of 101 things to do with a box you’ve been missing out on some fun training opportunities. 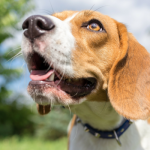 It gives you a chance to watch how your dog learns, and it’s a nice way for your dog to experience something new without any negative consequences. You start out with a box on the ground and without any cues let your dog investigate and decide what to do. When they decide to offer any behavior such as looking at or sniffing the box give them a treat and praise them. Then wait for them to offer another behavior and repeat. Shaping can be used with any item, not just boxes. Here’s an example of shape training a dog to crawl under an object. The best part about free shaping in particular is that your dog can’t lose; whatever behavior they choose will be praised. It can encourage shy or fearful dogs to try something new without having to worry about doing something wrong. And if your dog is anxious in new situations you can practice it from the safety of your own home. If you’re not sure where to begin with free shaping check out this article on shaping techniques. And if you’re still confused about what shaping is don’t worry, you’re not alone. It took me awhile to catch on until I saw this video by Dr. Sophia Yin that explains how to do some basic free shaping exercises with your dog. Teaching your dog how to play a fun nose work game such as find the treats will help boost their confidence by teaching them a new skill, and it’s a great way to keep them busy and mentally stimulated. It’s also a great way to strengthen the bond between you and your dog since it relies on working together. And since you can teach your dog to find the treats in your own home you won’t be dealing with a ton of distractions that might otherwise make your dog anxious. That ability to focus on “finding the treats” will boost your dog’s confidence by helping them learn to focus their energy into a specific job rather than focusing on the environment around them. As far as playing the game goes the goal of find the treats is simple enough — it’s teaching your dog to dog sniff out treats you hide around the house. When you’re first starting out you’ll want to make it easy, until your dog gets the hang of it. Have your dog sit in the stay position while you go around putting treats around the room as they watch you. After you’ve placed them come back over to your dog and tell them to “find the treats.” Keep it fun and positive for them by praising them each time they pick up a new treat. Once you’re dog has a good idea of what “find the treats” means you can start hiding them in more challenging spots. After some practice your dog will start to hone in on their natural sniffing abilities, and they’ll start relying on their nose to find those hidden treats rather than using visual cues. Another simple confidence building game for dogs is targeting. Targeting is teaching your dog to touch an object, most often with their nose. 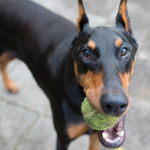 While it’s not traditionally thought of as a “game” it is an activity you can do with your dog in various situations to help boost their confidence. Teaching your dog to touch hands in particular can be especially helpful when teaching your dog to be more confident around strangers. It focuses their attention, and it lets them know that an approaching hand isn’t something they need to be afraid of. When it comes to teaching your dog how to touch your hand and some yummy treats are the only only things you need to get started. Then all you need to do is hold out your open hand towards your dog with your palm facing him. As soon as he sniffs, touches or licks your hand praise him and give him a treat. Switch to your other hand and repeat. Once your dog is familiar with this exercise add the word “touch” right at the moment he touches your hand. Most dogs are curious enough to check out your hand as soon as you put it in front of them, but if your dog shows little interest in touching your hand you can use treats in your hand to encourage them. As above you’ll praise and give your dog the treat as soon as they touch your hand. And after a few repetitions you can start adding the “touch” cue. Once your dog gets the hang of “touch” you can start work on it outdoors where there’s more distractions. And for shy dogs you can start working on it with your friends and neighbors by teaching your dog to “touch” their hands for a nice treat. Once your dog is confident enough to touch your neighbors hand without hesitations you can then move onto trying it with new people. For more information on targeting check out this article; it covers all the bases when it comes to teaching your dog to target. When it comes to confidence building games for dogs it’s hard to go wrong with interactive play. Play keeps dogs mentally and physically fit, and in addition it can help alleviate some behavioral problems such as anxiety and aggression. Plus games are a really fun way to strengthen the bond between you and your dog. One of my favorite interactive games is tug of war. It’s one of the best ways to engage in meaningful play with your dog, and it provides plenty of mental and physical exercise. And since it doesn’t require a ton of room you can play it indoors. I actually bring a tug toy with me on walks since it’s Laika’s favorite thing in the world; it helps focus her attention when we encounter something that would otherwise make her nervous. And contrary to what some people say playing tug will not make your dog aggressive, nor will letting them win will not make them dominant. Letting your dog win just makes the game more fun for your dog, and it encourages them to play more. And research has found that dogs who play tug with their owners tend to be more obedient and have higher confidence. Tip: Tug is a great interactive game for dogs, but there are a few basic rules to follow to keep it safe and fun. And if you don’t have a tug toy you can make your own with some fleece or old t-shirts. Fetch is another interactive game you can play with your dog to help boost their confidence. It will strengthen the bond between you and your dog, and it’s great exercise. And like tug, it’s a fun way to engage with your dog to help them focus on the moment at hand — having fun. If you want to play indoor fetch I recommend using a lightweight ball to avoid breaking all of the things (something I learned the hard way). And if you have a high energy dog you can teach your dog to play fetch with a frisbee outdoors. If your dog doesn’t know how to catch a frisbee I’d start out by using a soft disc. Traditional plastic frisbees are hard, and if they end up hitting your dog in the face they can discourage them from trying to catch it in the future. Practice by getting your dog excited about the frisbee by tossing it short distances or rolling it on the ground. Encourage them when they start to follow it around and chase. Once your dog is excited to chase it you can increase the distance and start tossing it. Tip: If you’re looking for more suggestions on interactive games check our list of 10 fun games to play with your dog & 33 ways to keep your dog busy indoors. When it comes to boosting your dog’s confidence one of my favorite methods is doing some trick training. You can brush up on your dog’s basic obedience skills such as sit, stay and come here, or you can teach them some advanced tricks such as weaving through your legs (it’s much easier than it sounds). If you’re not sure where to start when it comes to trick training here’s a handy list of 52 tricks with instructions that you can work on. One fun trick to teach your dog (if their toys are kept in a container) is to put their toys away. If your dog already knows “drop it” have your dog pick up a toy and drop it when they’re standing over the container. Praise them like crazy, and rinse and repeat. I know it sounds weird to teach your dog to clean up after themselves, but it’s actually a lot of fun. Teaching your dog new skills boosts their confidence, and it’s a simple way to give them more mental stimulation. If you want to impress your friends teach your dog to fetch you something from the fridge. To make it simple for your dog tie a towel around the handle of your fridge so it’s easy for them to pull open the door. Another fun trick to teach your dog is the names of their toys. Do you already have names for all of your dog’s toys? If so you’re already ahead of the curve. Start by picking out one toy and toss it for your dog while using the toy’s name. After some practice & praise your dog will start to assign that verbal name with the chosen toy. Once you think your dog knows that’s toys name you can test their skills by seeing if they can “go find” that toy among their other ones. Repeat this process with their other toys, and pretty soon you’ll have a dog that can pick out a specific toy from a pile. On average dogs can learn about 165 different words, so your dog has the potential to learn the names of a lot of toys. Teaching your dog the names of their toys is a great way to boost their problem solving skills and confidence. Confidence boosting games are a relatively simple (and fun) way to help with your dog’s fearfulness. 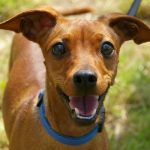 Playing games is a simple way to work on boosting your dog’s confidence in various situations, though it is important to keep your own dog’s pace in mind. Some dogs are much more fearful than others, and trying to manage severe anxiety can be challenging. If you’re dog exhibits extreme fearfulness or shyness I suggest reaching out to a trainer or behaviorist in your area that focuses on using positive reinforcement techniques. This post contains affiliate links; if you make a purchase I’ll earn a commission. Please see our disclosure page for more information. I play find the treats with my dogs, Princess and Niko, a lot. I used to play Hide and Seek with Princess, however, she ended up learning all my hiding spots and could always find me right away. Thank you so much for sharing! Can’t wait to try this with my very shy German shepherd Simba! 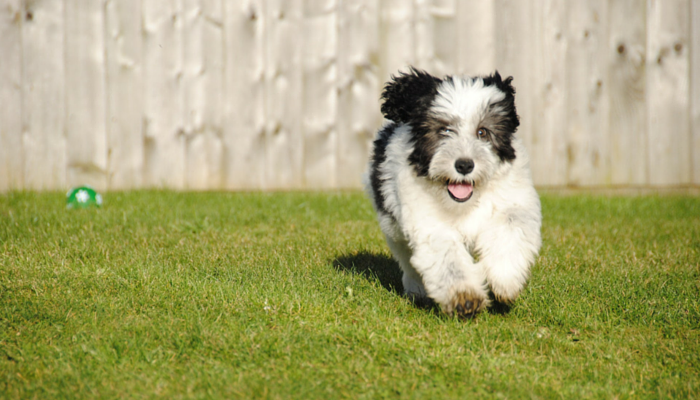 Training is definitely a great way to give your pup more confidence, making it a fun game is even better. Great ideas. Thank you for the article. Never knew that I can make my furry companion more confident this way.